For some, there is nothing more enjoyable than a delicious home-cooked Christmas dinner on the festive day. Cooking up a show-stopping Traditional Christmas Feast, Dominic Franks of BelleauKitchen shares his Traditional Christmas Feast using his Leisure range cooker to help you please every palate amongst your loved ones and guests. For me, this is essentially Christmas in a bowl. It’s warming and hearty yet won’t fill you up completely. It has the most wonderful Christmas taste and is a great way to ease you into the spirit of what's to come. 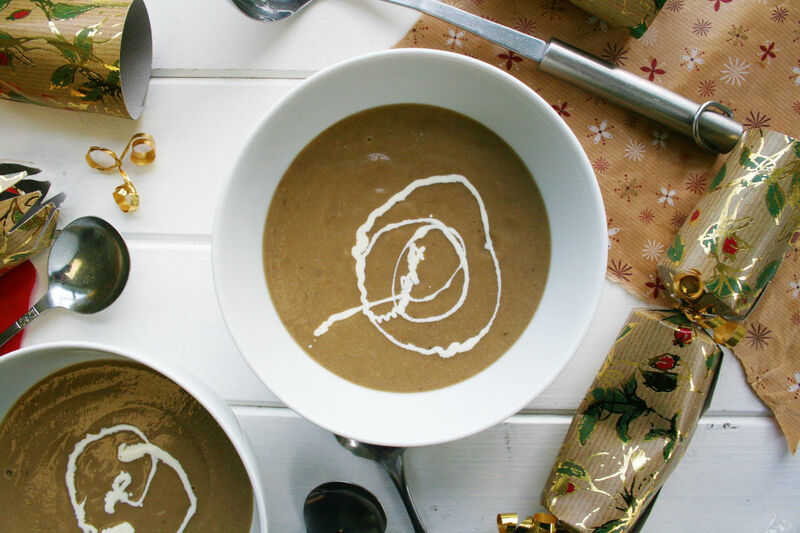 It's also one of my mum's best soup recipes, she often made it for winter dinner parties leading up to Christmas, when we were growing up at home and the aroma of it reminds me of sitting on the stairs waiting for her friends to arrive before going off to bed, knowing what deliciousness they were about to enjoy! In a large pan, sauté the onions, celery and carrots in butter until soft and the onions are beginning to turn translucent. Add the chopped mushrooms, stir and then place the lid on the pan and let them sweat down for 10 minutes. Add the stock and then the chestnut puree, let it simmer for 25 minutes before blitzing until totally smooth, with a hand-blender. I love turkey and I’ve never really had an issue with it drying out. I’ve used this method – placing the stuffing under the skin on the breast to great success, as it keeps the breast meat really succulent. You’ll need to watch it though because it does tend to brown quicker than the rest of the skin, so you can cover it with foil whilst the rest of the turkey is browning. I used my standard fan-assisted oven for the roasting, leaving the tall oven in my Leisure Range Cooker to do all the veg. Place a large pan on a gentle heat and melt a little oil and butter, add the onions and sauté for about 5 mins until soft, then add the apple and 3 teaspoons of dried sage, stir it all together and let it sweat for another 5 mins – set aside to cool. In a large bowl combine the sausage meat, breadcrumbs and the cooled cooked onions until well mixed – set aside. 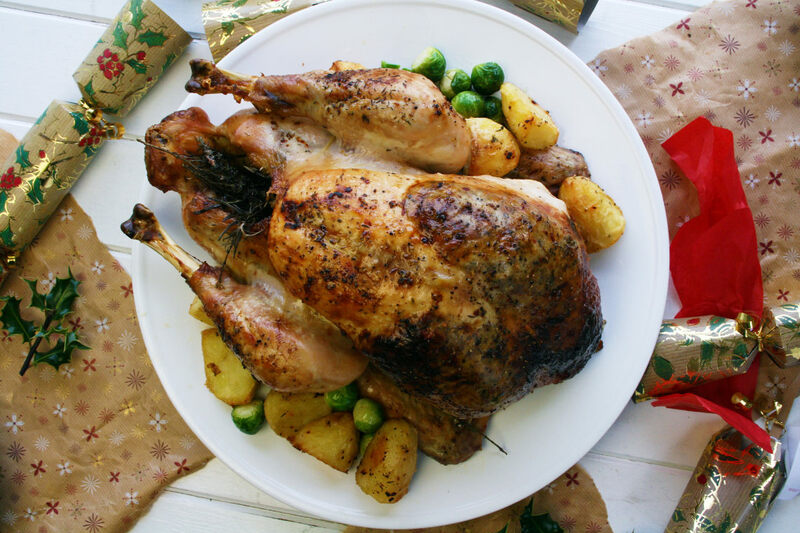 Preheat your oven to 190°C You will need a large roasting tin, big enough to take your turkey and of course fit into your oven – line the tray with foil leaving a large overhang – long enough to wrap over your turkey. Lay all the chopped veg into the bottom of the roasting tray. Wipe the turkey inside and out, with kitchen paper, and place it on a board, with the neck end towards you. Find the edge of the skin that's covering the turkey's breasts and gently peel it back. Work your fingers and then your hand under the skin, freeing it from the meat. If you're careful you should be able to pull all the skin away from the meat, keeping it attached at the sides. Wiggle gently making sure you don’t make any holes. Lift the loose skin at the neck end and spoon the stuffing between the skin and the breast, tucking the flap of skin underneath to stop anything leaking out. Pop the orange into the cavity. Weigh the stuffed turkey and calculate the cooking time (about 20 minutes per 500g/1lb 2oz). Place the bird on top of the veg in the roasting tray, rub it all over with olive oil and season well. Cover with tinfoil and place in the preheated oven. Turn the heat down right away to 180°C/350°F/gas 4, and roast for the calculated time, or until the juices run clear from the thigh if you pierce with it a knife or a skewer. Remove the tinfoil for the last 45 minutes to brown the bird. Carefully lift the turkey out of the tray and rest on a board that’s covered loosely with foil for at least 45 mins. When the resting time's nearly up, skim the surface fat from the roasting tray and add the flour and stock. Place the tray on the hob and bring to the boil on a high heat. When the gravy starts to thicken, strain it into a bowl. To begin, let's choose a potato... Heston would choose The Maris Piper, Delia would go for Desiree, my mum always goes for something with a red skin. Today I've found some red-skinned Lincolnshire potatoes. Rather generic sounding I agree but un-washed and in the paper bag they look like they'll do the trick! I go for 4 potatoes per person. Now, fill a large pan with water, chuck in a pinch of salt and bring it to the boil. Peel and cut the potatoes. I like large roasties, so, depending on size of the potato I usually cut mine into 3rds. Boil the potatoes until just before soft (really depends on size)... you don't want them to collapse. My grandma used to time this so that they were just about to fall apart and then lower each one gently into the roasting pan! Next, I drain the water from the potatoes but leave them in the pan and add a glugg or two of extra virgin olive oil, plenty of salt and pepper and a handful of fresh rosemary, then I place the lid back on the pan and violently shake the potatoes to fluff up the flesh. Then, they go into the hot oil in the roasting pan and into a very hot oven until golden and crispy. 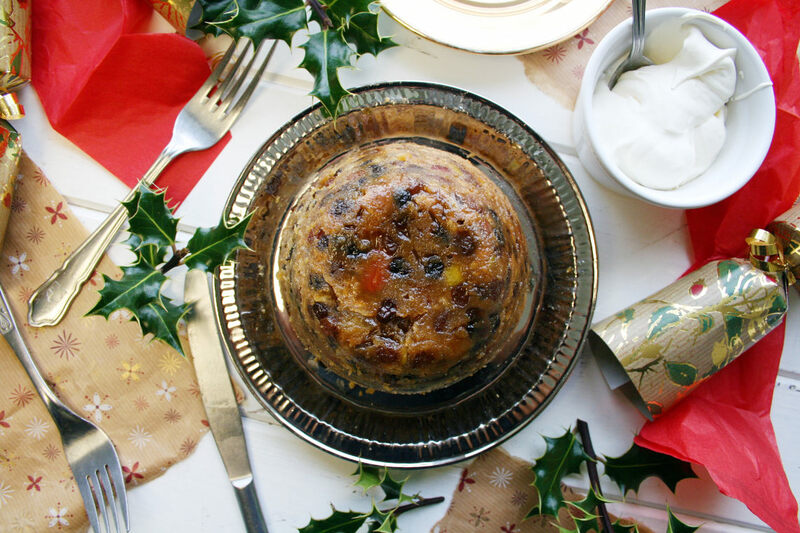 This is a very simple, throw it all into the bowl, Christmas pudding, made special by the generous amount of booze in both the pudding itself and the whipped cream. I warn you now, the booze will take your breath away so feel free to reduce it or replace entirely with either orange juice or cold tea. I love this pudding because it’s not too dark or too rich and is easy to eat. It steams really well on the hob in a steamer and will keep for a month in fridge or in an airtight container, so this can be made well in advance of the big day itself. Grease a 1 litre pudding basin the night before you make the pudding place the mixed fruit and peel into a very large mixing bowl and liberally soak in the liquid of your choice, if you don’t want it to be alcoholic it could be earl grey tea but a good triple sec would be the best - roughly 300ml and leave to soak overnight. The pudding will keep for up to three months wrapped in foil and placed somewhere dark and cool, each week you could drizzle with a tablespoon or liquor to keep it moist. To reheat on Christmas day simple place in the oven for half of the original cooking time on a low heat. To serve, gently whip up some cream to the soft peak stage and stir in a tablespoon of triple sec.